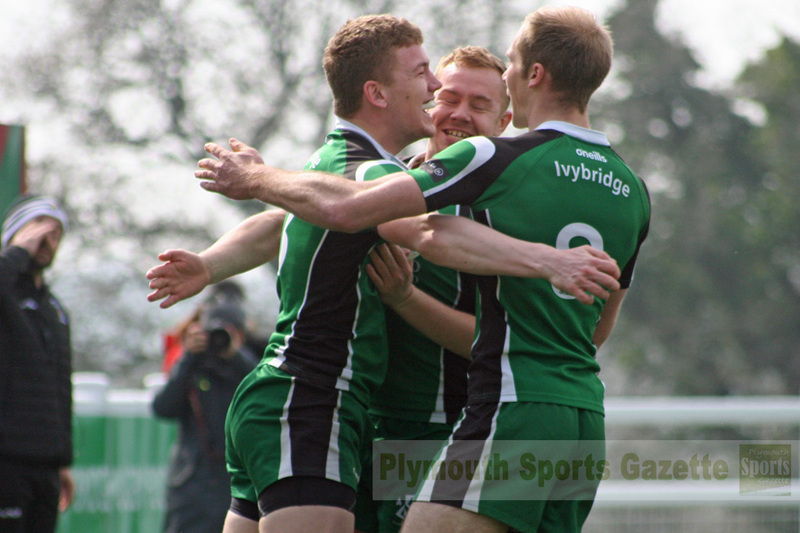 IVYBRIDGE turned on the style in their final home match of the season to beat Brixham 37-28. The win guarantees they will finish in the top five of the South West Premier, which will be their highest league placing in their history, and they could get finish third if they were to beat Camborne away next weekend and Maidenhead lose to Bracknell. They did the damage on Saturday in the opening 20 minutes when they scored four unanswered tries to take a 24-0 lead. Both fourth-placed Ivybridge and Brixham knew they needed a bonus point win to have any hope of reaching the Devon Cup final and the hosts really came out fired up. The game was only five minutes old when Damon Akerman scored the first try. It came after Billy Pinkus had missed a penalty but Ivybridge ran back the resultant drop-out with serious intent and the ball found its way to winger Akerman, who showed great speed and strength to avoid a tackle and score in the corner. Four minutes later, the Bridgers claimed a second when young centre Will Lamont cut straight through the middle of Brixham’s defence after good play from a line-out. Billy Pinkus, as he had done with the first try, added the conversion to make it 14-0. That became 19-0 on 15 minutes when Billy Pinkus, playing against his younger brother Mitch, touched down in the right corner after winning the race to a kick. Scrum-half Ben Watts then added the all-important fourth six minutes later from close range. Brixham finally got into the game on 29 minutes when Tom McLean scored on the right and Mitch Pinkus converted. Four minutes later Ivybridge had Jamie Tripcony yellow carded and Brixham took advantage of the extra man to score a second try through Connor Bedwell. Ivybridge should have scored a fifth just before the break but they knocked the ball on right on the try line as they went in at the interval 24-14 ahead. 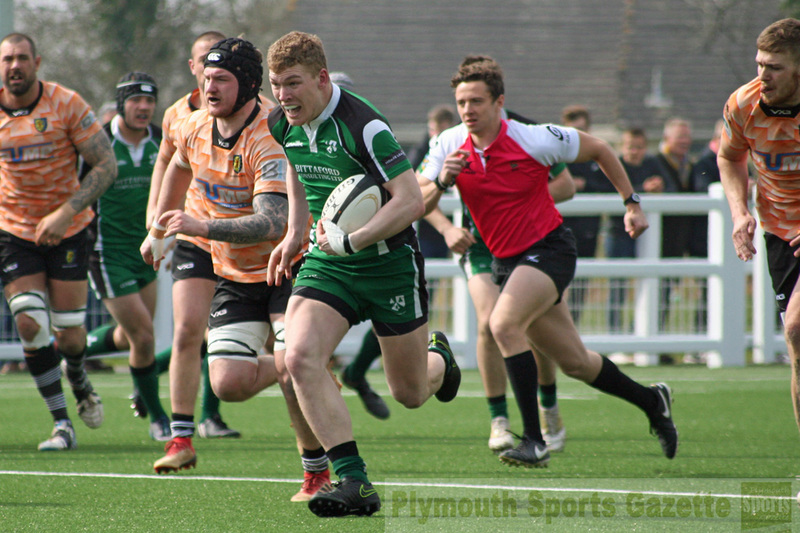 Billy Pinkus extended that advantage by three points early in the second half before Russell Morris scored from close range for Brixham to pull them to within six. 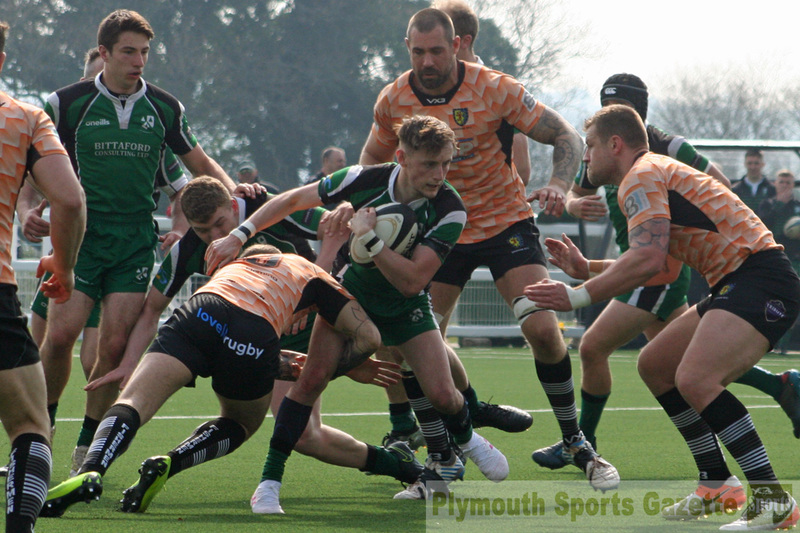 Another penalty by Billy Pinkus gave Ivybridge more breathing space before Marcus Prout scored from a catch-and-drive move after an incredible 70-metre kick to touch from a penalty by Matt Grieveson. 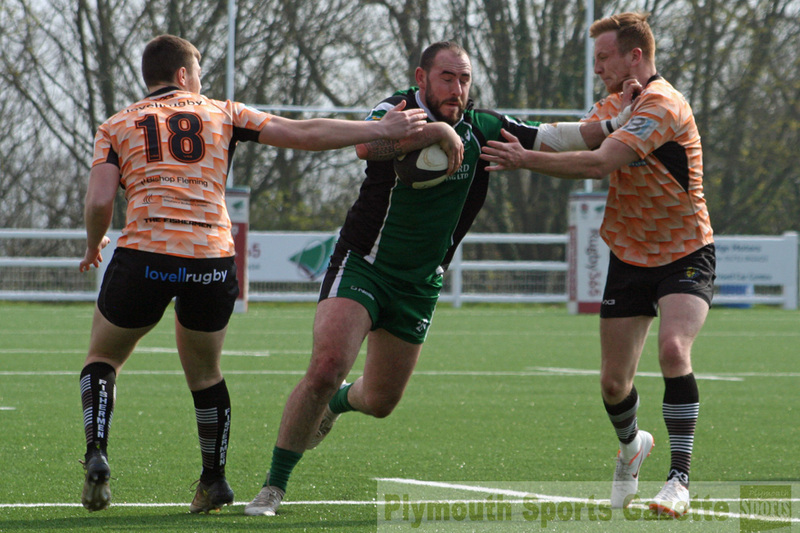 Former Ivybridge player Scott Puleston scored an injury-time fourth try for Brixham but it was too late for them to get anything out of the game. Afterwards Ivybridge’s player-coach Lewis Paterson, who was back playing for the club after a few weeks out, said it was a ‘cracking way’ to end their home campaign. “It was really, really good,” he said. “It was a couple of players’ last games for the club and people were up for it. We were all pretty driven for this game with it being Brixham in our last home game of the season. “It was just about being clinical and we were. We took our chances and executed really well. On his team’s impressive start, Paterson said: “We needed to get some tries on the board to get into the Devon Cup final and there wasn’t a better way to do that than doing it early doors. We could then just keep the scoreboard ticking. DEVONPORT Services’ disappointing end to their first season in South West One continued on Saturday when they lost 46-26 at North Petherton in their final away game. Six weeks ago Services were threatening to break into the top three but now they will have to make do with either a seventh or eighth placed finish after a fifth consecutive defeat. They did not have any luck at North Petherton with decisions going against them, but head coach Mike Lewis admitted his team should have been better against a much bigger side. “They were huge – twice the size of us,” said Lewis. “And our defence was not good enough. “They had quite a boring game-plan, but it was effective. Mark Friend scored two tries for Services – one in each half – with Ty Colwill also touching down to go with a penalty try. Richard West kicked two conversions as Services did at least pick up a bonus point. Saltash may have done enough to stay in Western Counties West after beating Winscombe 21-18 at home on Saturday. The win means they cannot finish in the bottom two, which normally means certain relegation, but the third-from-bottom spot – the nervous ‘wait-and-see place’ – will be decided on the final day of the season. They, Bideford and Chard could all still finish in that position, where relegation will not be known until after all the play-offs have taken place. However, Saltash, who play leaders Sidmouth next week, do have the advantage of being three points ahead of Chard and two ahead of Bideford. However, Saltash will not want to leave anything to chance and so will be looking to back up their victory over Winscombe by upsetting title-chasing Sidmouth next week at Moorlands Lane. Their win over Winscombe came thanks to a good second half spell. The match had been 11-11 at half-time with Harrison Reburn scoring a try for Saltash to go with two penalties from Kieran Down. After the interval Ollie Mulberry and Phil Eatwell put Saltash in command before Winscombe scored a late try to set up a few nervous moments. However, the Ashes hung for a crucial four points. PLYMSTOCK Albion Oaks will finish fourth in the Cornwall/Devon League after they beat Liskeard-Looe 29-14 in their final home match. 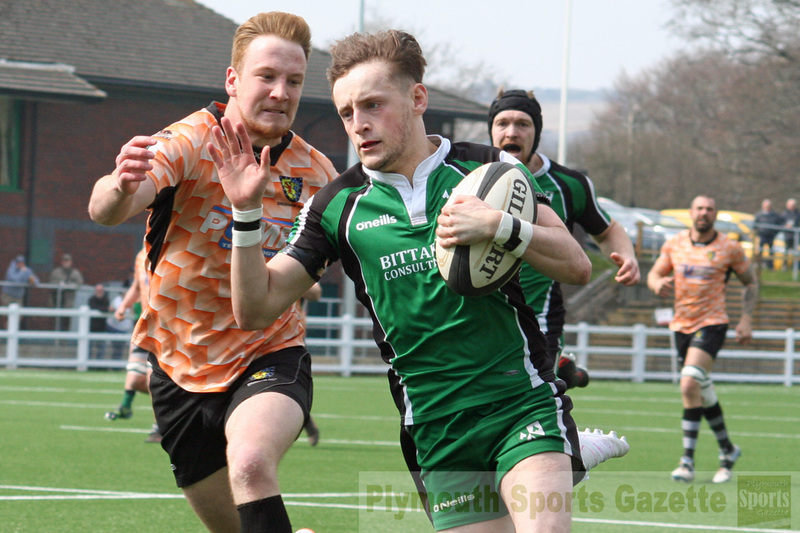 Oaks ran in five tries – two in the first half and three in the second – to bounce back in style from their heavy defeat at third-placed Bude the previous week when they had travelled without a number of key players. “We had a much better team this week and we played really well in patches,” said player-coach Aiden Taylor. “They (Liskeard) defended really well and kept the ball for long periods of a time, but it was a nice dry day and we were able to score five tries on our VP day. We were happy with the performance. Joe Brearley, Aiden Taylor, Kieran Jamieson, Corey Jamieson and Dave Byng scored tries for Oaks on Saturday, with Hayden Coles and Byng kicking a conversion apice. Liskeard’s points all came in the second half and were courtesy of a penalty try and a touch-down from Oliver Aggiss, which Nick Parker converted. Liskeard will finish a creditable seventh on their first season back in the league. Tavistock have dropped down to ninth after losing 46-0 at home to Honiton, who were promoted on Saturday thanks to their win and Bude’s defeat at South Molton. Honiton were 32-0 up at the break against Tavistock thanks to tries by Ben Webber, Adam Thompson, James Coutts-Tucker and Devon captain Nathan Hannay. After the interval they added further touch-downs from Thompson and Hannay. “It was boys versus men first half,” admitted Tavistock’s Hammy Kerswill. “We were really poor and couldn’t handle the way they moved the ball and slipped off too many tackles. Penryn will join Honiton in Western Counties West after they beat already-relegated Plymouth Argaum 79-0 at Bickleigh Down on Saturday. Argaum battled hard but Penryn were a class above them, with Josh Chambers finishing the day with four tries. The visitors led 43-0 at the break thanks to touch-downs by Chambers (3), Sam Hitchens (2), James Salisbury (2) and four conversions by Nathan Strick. The scoring continued at a similar rate after the interval with Ben Trevaskis, Chris Hellier, Aaron Cockle, Grant Randlesome, Tom Wallace and Chambers going over. Argaum did have a couple of good chances to score but could not take them and it means they have now gone three games without scoring a single point. OPMs claimed their first win of 2019 thanks to an impressive comeback against New Cross in their final home match of the season. The Old Boys were 27-10 down just after half-time but came back to win 39-27 and move up to ninth in the table ahead of Dartmouth. It was a perfect way for them to mark their opening of their new bar at King George V Playing Fields and their VP day, where they managed to get three teams out. Jack Mitchell scored twice for OPMs, with Ben Hooper, Matt Thompson and Huw Moorcraft also touching down and Sammie Matts kicking the rest of their points. OPMs’ last win had come on December 8, so everyone was relieved to end their losing run ahead of a trip to champions North Tawton. “It would have been nice to have had a win a lot sooner,” said Garratt. “But considering the day and the event we had on it was nice to get it this weekend. It was also a bonus point win so we go above Dartmouth now. Tamar Saracens’ long unbeaten run finally came to an end on Saturday when they were beaten 20-8 at the Parkway by league runners-up Exeter Athletic. Sarries were leading 8-5 at the break thanks to a penalty by Tom Rigby and a try from Frazer Tatchell. But a good spell early in the second half by the visitors got them ahead before the game was ended on 68 minutes due to a neck injury to an Exeter player. “We weren’t intimidated by them and we started well,” said spokesman Marc Cioffi. “Within about 20 minutes we were 8-5 up. “We know we could have won the game, but they did score a couple of well-worked tries. “It was just a frustrating day for us and I think we are kicking ourselves as we should have been better. The biggest thing we are gutted about is that we could have capitalised on other results. Cioffi admitted it would have been nice to have played the last 12 minutes just to see if they could have got back into the match but they all understood the situation with no other pitch to move to while they waited for an ambulance to arrive. Old Techs continued their good try scoring form by running in four to beat third-placed Exeter Saracens 28-15 at Weston Mill. The first half was tight, with Techs just edging it 7-5, thanks to a good try by flanker Jack Courtney, who had just return to the country that morning from military duties overseas. The game really opened up after the interval and Techs scored three more touch-downs through powerful centre Matt Simmonds, winger Jack Williams and fellow back Peni Turua, who produced a great side-step to get away from his opposite man. Billy Evans kicked one conversion, with Dan Bartlett kicking the other three. Techs have the Lockie Cup to look forward to but before that they have a trip to New Cross next week where they will be taking a coach up to celebrate the end of the league season. Plympton Victoria, DHSOB and University of Plymouth all provided opposition for OPMs’ second and third teams at King George V Playing Fields on Saturday in a celebration of rugby at Elburton.